This article is about book by Mary Shelley. For the village in Germany, see Frankenstein, Saxony. Frankenstein; or, The Modern Prometheus is a novel written by Mary Shelley. It is about a creature produced by a strange scientific experiment. Shelley started writing the story when she was nineteen. It was published when she was twenty-one. The first edition was published anonymously in London in 1818. Shelley's name appears on the second edition, published in France in 1823. Shelley had travelled in the region of Geneva, Switzerland, where much of the story takes place. Ideas about occultism were topics of conversation among her travelling companions, especially her future husband, Percy Bysshe Shelley. Mary, Percy, Lord Byron, and his doctor John Polidori decided to have a competition to see who could write the best horror story. After thinking for weeks about what her possible storyline could be, Shelley dreamt about a scientist who created life and was horrified by the result. She then wrote Frankenstein. Since publication of the novel, the name "Frankenstein" is often used to refer to the monster itself. 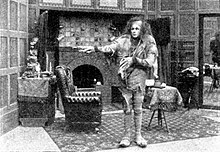 This usage is sometimes considered erroneous, but usage commentators regard the monster sense of "Frankenstein" as well-established and an acceptable usage. In the novel, the monster however is called "creature", "monster", "fiend", "wretch", "vile insect", "daemon", "being", and "it". Speaking to Victor Frankenstein, the monster refers to himself as "the Adam of your labors", and elsewhere as someone who "would have" been "your Adam", but is instead "your fallen angel." Victor Frankenstein is a scientist who wants to create life itself. He stitches together parts from the dead bodies of criminals executed at the gallows. He brings his creation to life during an electrical storm. The monster scares Frankenstein. It begins to kill without reason or cause. Frankenstein chases the monster to the Arctic, and dies pursuing the creature. The monster kills himself. This page was last changed on 4 January 2019, at 04:05.